No matter how many spots are up for debate, many with legitimate cases, there is no denying the top team in the Nike EYBL this season. Howard Pulley (MN), now a winner of 11 straight, is on fire, and it appears no team can slow the Panthers down. How does the rest of the field look? Well, let's just say it certainly looks different than it did two weeks ago after Session III at LakePoint Sporting Community - Champions Center in Emerson, GA, this past weekend. Howard Pulley solidified its case as the No. 1 overall seed. Team CP3 (NC) moved into the No. 1 mix. Team Takeover (DC) shot up the standings. Bradley Beal Elite (MO) cruised through an easier schedule. Team Melo (MD) got on the right side of the bubble. Pro Skills (Texas) climbed out of the cellar. 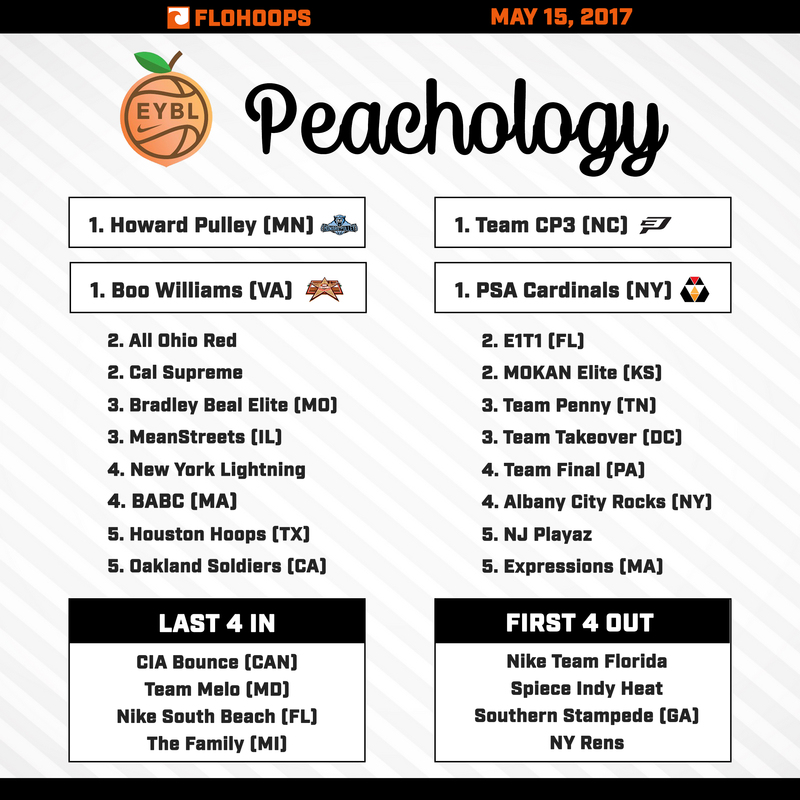 That's what a 4-0 record did to these six teams, changing the entire landscape of Peach Jam heading into the final session. From the very last spot on the bubble to securely in the field as a No. 4 seed, Team Final (PA) was definitely the biggest jumper of any team thanks to stellar performances by wings Louis King and Cameron Reddish. Others that had strong 3-1 weekends include California Supreme (CA), New York Lightning (NY), Team Penny (TN), and The Family Detroit (MI). Then, of course, there is Southern Stampede, which also tallied three wins after only one total entering the weekend. Was it the target on the back? What it the pressure? Was it simply bad luck? Perhaps all of it was a factor to a degree but some of the top or trending teams from two weeks ago took a tumble. No squad fell harder than Houston Hoops, though, which went 0-4, while previously unbeaten MOKAN Elite (KS) took three losses. BABC (MA) and CIA Bounce (MA) each went 1-3, and E1T1 United (FL) went 2-2 to round out those who saw its stock dip. The good news is the list shrunk in half this past weekend. The bad news is there are still two teams without a win this entire season. Give it up to Pro Skills (Texas) for turning it completely around and going undefeated, and props to first-year squad Portland Basketball Club (OR) for getting on the board. As for Nike Phamily (AZ) and Team United (NC), there is still hope to finish on a high note in Los Angeles after a frustrating 0-12 record through the first three sessions.